Plans are dimensioned in Imperial measure. They are NOT currently available in metric. While they plans are not available in metric, numerous machines have been constructed in countries that use metric measure. This can be done either by adapting the plans for locally available metric sizes of materials, or by sourcing materials from the US. The plans include a list of suppliers, many of whom ship internationally. All axes are controlled by standard ABEC7 bearings riding on cold rolled steel (CRS) rails. All bearings are provided with micro-adjustable setscrew for precise and easy adjustment. The design of the machine is based around a step by step alignment procedure, that allows for highly accurate setup with very simple tools. The machine is designed to use a trim router, such as the Bosch Colt, or Ridgid R2400/2401. Exact dimensions of cutting envelope in the Z axis travel direction will depend on configuration of router mount, length of router bit, positioning of limit switches, and thickness of spoilboard beneath the work piece. overall machine size: 32.5" x 26" x 26"
The machine is built entirely from standard stock material sizes of plywood, aluminum, and steel. The original material thickness is used for all critical dimensions. Materials were chosen for this design in order to give the highest possible machine rigidity for the cost. No MDF (medium density fiberboard) is used in the construction of the machine, as it is too flexible to generally result in a machine capable of cutting aluminum. Mechanical parts: Aluminum and steel. Belt drive can use either open-ended belting or a closed belt, depending on availability. Z-axis anti-backlash nut is a commercially available product. Z axis, acme leadscrew with Derlin anti-backlash nut. The machine is also capable of light duty work in aluminum and brass. Please keep in mind that while these metals can be cut on the machine, there are limitations to to their use. The machine uses a high rpm trim router as a spindle, which is intended for cutting of wood and will impose limitations on depth of cut and feed rates when working with metal. Router longevity may also be effected. The machine is also not intended to be equipped with provisions for cutting fluids. Minimum recommended size: 275 oz./in. 3 axis microstepping drive board, and power supply. Cost to build the machine will vary with geographic location and local costs of materials. Geographic location will also impact shipping costs on those materials and components not available locally. An estimated budget for constructing the machine in the United States is $500. This includes materials to construct the basic machine, but does not include cost of the spindle router, stepper motors and electronics, a computer, or software. Stepper motors and drive electronics typically cost between $200-$600. competitive with light commercial machines costing many times more. highest machine rigidity per dollar. high level of accuracy and precision. no welding or machining necessary. ease of construction with simple shop tools. Emergency stop switch and machine limit switches. 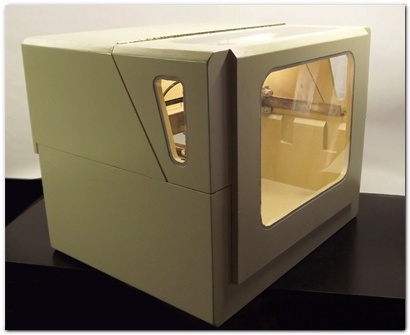 The rear of the machine enclosure is equipped with an opening door to allow work pieces that are larger than the bed area to protrude.